Every day is our happy day because of you. Your dad and I want to go home early para makalaro ka namin, and every time you smile on us, hay nawawala pagod naming dalawa. You know what anak, your daddy and I have so many plans for you actually right after your 1st birthday we will go to beach, you will experience your 1st airplane ride. Are you excited for that? Yehey! We will go to Boracay! Yahoo… But for now baby, let’s celebrate your 7th month, daddy will buy cake for you, mommy and mamila will cook Crispy Pata and Pancit for our dinner and for sure your Tita Ninang has a gift for you. Look Baby, we love you so much! Rhian, you will always be Daddy’s Girl and Mommy’s World. No matter what happens you will always be our baby girl, kaya sa mga manliligaw sayo in the future dapat malakas loob nilang harapin kami ng Daddy mo and like your dad told you “No Boyfriend Until 26!” Hehe. 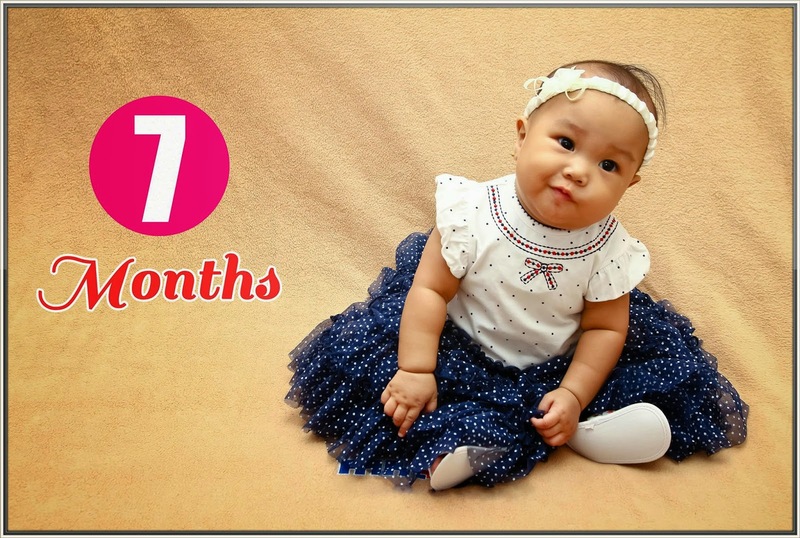 Happy 7th Month Baby Love! Hahaha! ang strict naman ni Daddy! Hehe. Cutie pie talaga ng baby na to eh. Bagay kayo ni James! Charot! Hahaha. =) Happy 7th month Rhian bebe.